Experiencing acid reflux more than two times a week indicates gastroesophageal reflux disease, known as GERD, according to the National Digestive Diseases Information Clearinghouse. Cherry juice may or may not aggravate symptoms because people respond differently to foods. You may have specific items that trigger acid reflux symptoms. Cherries contain some acid content. You may have to test cherry juice to see if it results in symptoms. If you have frequent acid reflux, consult with your doctor, who can provide dietary and medical advice. Acid reflux results in stomach acid backup into the esophagus. This can cause heartburn, the burning or painful sensation in your upper chest and throat, or a sour or bitter taste in the back of your mouth and throat. Certain foods trigger acid reflux by relaxing an esophageal muscle. The ring-like muscle usually opens as contents enter the stomach before closing. A relaxed muscle does not shut tightly and allows stomach acid backup. Citrus fruits and juices or tomatoes may trigger symptoms because of their acidic content. Other triggers include fried or fatty foods, chocolate, carbonated beverages, caffeine and alcohol. Sweet cherries have low acid content, but sour cherries have a higher acid content that brings about its tart flavor. 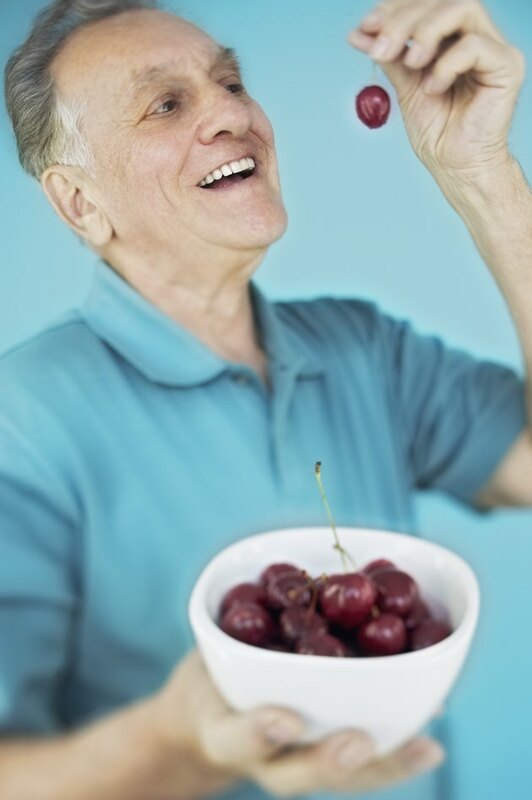 Cherry juice may have anti-inflammatory properties and has been used to relieve pain and inflammation from arthritis, gout, muscle pain and back pain. Some home remedies call for drinking 2 oz. of cherry juice for relief, but research remains inconclusive on its effectiveness. Your risk of GERD symptoms from drinking cherry juice may depend on how much you drink. Although cherry juice may have a low acid content, drinking it in excess may trigger acid reflux symptoms for some people. However, fruits with the highest concentrations of citric acid include lemons and limes. Oranges, grapefruit and pineapple are often listed as foods to avoid in GERD diets. The diets usually don't list cherries as offending foods, but the amount you consume or the way your body responds to cherries or cherry juice may determine your symptoms. Try cherry juice in small amounts to see if you experience symptoms. Keeping a food journal for a week helps you identify acid reflux triggers, according to the McKinley Health Center, University of Illinois at Urbana-Champaign. Write down the items you consume and the symptoms that follow to gradually eliminate triggers from your diet. Acid reflux diets usually allow noncitrus fruits and juices, vegetables, whole grains, lean meat, skinless poultry, fish, and low-fat or nonfat dairy products. A low-fat, high-fiber diet may protect you from acid reflux symptoms.